"Apache Spark and In-Memory Computing"
Apache Spark is a fast and general engine for large-scale data processing. To handle increasing data rates and demanding user expectations, big data processing platforms like Apache Spark have emerged and quickly gained popularity. 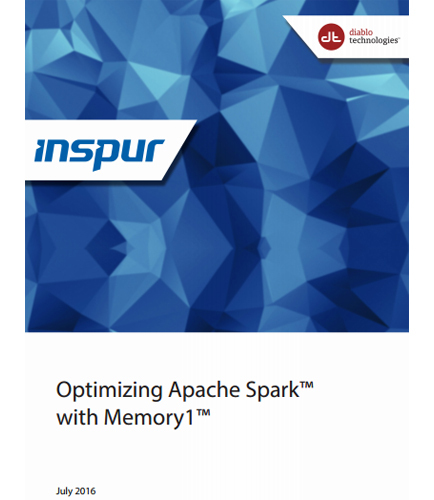 This whitepaper on “Optimizing Apache Spark with Memory1”demonstrates that by leveraging Memory1 to maximize the available memory, the servers can do more work (75% efficiency improvement in Spark performance), unleashing the full potential of real-time, big data processing. What are the issues that subvert the full potential of Apache Spark’s disaggregated approach? How to simulate the critical demands of a typical Spark operations workload? How to eliminate the hardware cost concerns traditionally faced in multi-server Spark deployments? What efficiency metrics are involved in the Spark operations?